Each time a new technology rolls out, legal decisions follow. Social media is the latest. Remember the cyberstalker? How about Facebook’s lawsuit against Power.com? Or the class action against Facebook over its privacy settings? The latest twist involves a case filed in the United States District Court for the District of Minnesota, TEKsystems, Inc. v. Hammernick, No 0:10-cv-0081. It is being heralded as the beginning of a brand new type of lawsuit – a new world of litigation. The case boils down to a claim by an employer that the employee’s use of a social media site (LinkedIn) violated the employer’s rights. Who owns the employee’s “connections” (or contacts)? Can the employee “connect” (or communicate through LinkedIn) with certain individuals without violating the employee’s restrictive covenants (a noncompete and a nonsolicitiation agreement). While it may be true that the case is the first to raise the issue of the proper balance of employer/emplee rights in social media, the underlying issue is really nothing new. Does your company issue Blackberries, iPhones, or other smartphones? How about laptops with Outlook? How many employees limit the contacts stored on those devices to business-only contacts? The balance of rights in the information about the contacts has been a regular issue in many post-employment disputes – as has the substance of texts and emails to former customers and colleagues. To be clear, lest you think that this is purely a technology issue, anyone remember the Rolodex? (For those who don’t, look at the picture above.) 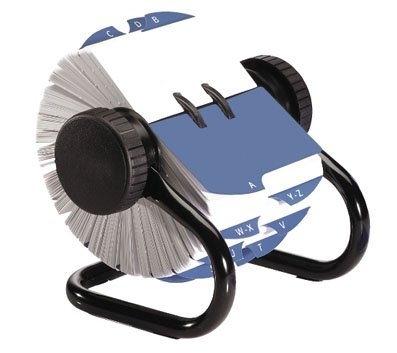 With a Rolodex, you couldn’t just take a copy of your contacts – you had to physically remove the cards with the information about the contacts you considered to be your own, or worse, take the entire Rolodex. So, do you need to “disconnect” from people on LinkedIn or “de-friend” people on Facebook, the answer lies less in the technology and more in the underlying state law of trade secrets and restrictive covenants. This brings us back to where we started: Is Social Media a New World? No. It’s just another example of “what’s old is new again.” Just as you updated your policies to include computers, Blackberries, iPhones, etc., update them to address social media.